A child reminds everyone to embrace their own special something in this joyful expression of self-love. When a drawing of a little girl comes to life, she boldly declares that she doesn't want to be erased, or put into a picture that doesn't feel like her true self. Instead, she decides to speak up in a powerful way. And she has some words of advice: embrace what you have, love yourself, and "rock what ya got." 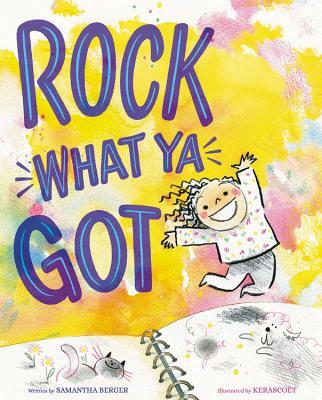 In this affirmation of self-identity and girl power, a child's memorable mantra offers a timeless lesson, reminding readers of all ages, backgrounds, and abilities that it's okay to be yourself. Bold illustrations from Kerascoët (Malala's Magic Pencil) bring the engaging story to life. Samantha Berger has written picture books including What If..., Crankenstein and A Crankenstein Valentine, Witch Spa, Snoozefest, Santa's Reindeer Games, and Martha Doesn't Say Sorry, which won a Parent's Choice Award Honor. When she isn't writing, she's doing voice-overs, traveling the world, and helping rescue dogs. Samantha splits her time between New York City and California. Kerascoët is the pseudonym for New York Times bestselling husband and wife team Sebastien Cosset and Marie Pommepuy, whose comics and graphic novel work Publishers Weekly has called "unforgettable." They work in ink and watercolor. They recently illustrated Malala's Magic Pencil by Malala Yousafzai and James Patterson's Jacky Ha-Ha, and their own I Walk with Vanessa. They live in Paris, France. "Berger's prose is a joyous celebration of self-love and empowerment... Kerascoët captures this same exuberance and breathes life into every inch of the page... Energetic."